Larry Glass is a firm believer in the "broken windows" theory, which holds that if you neglect the little problems, your neighborhood will go downhill fast: Start with a busted window, this theory goes, and before long you'll have graffiti on the walls, trash in the streets, apathetic (or just pathetic) residents turning to petty crime, theft, domestic violence. Soon, you've got a full-fledged problem house on your hands -- one of those nightmare properties that's perpetually lit by the spinning disco lights of patrol cars. If only someone had fixed that damn window. If you're unlucky enough to live near one of these festering dens, you'll know it. Glass sure does. Three doors down from him, in Old Town Eureka, there's a house that he says is the main source of crime in his neighborhood -- has been for years. And his is not a unique situation. In 2006, when Glass was canvassing Eureka's streets in his run for City Council, he heard the same story again and again -- a story he's continued to hear during his tenure as Eureka's First Ward representative. It goes like this: "People had problem houses in their neighborhood, [and] they were all just completely exhausted from raising the issue with the City and having nothing happen." Glass, looking rather exhausted himself, spoke these words at Eureka City Hall last Tuesday evening during an informal public forum. Not many had shown up -- maybe 15 people, most of them landlords and property managers who'd come looking for another fight in a battle they've been having with Glass since April, when he unveiled his plan to address the crime and blight caused, he says, by Eureka's problem rentals. The plan, which Glass and a city-approved citizens' task force had been developing for two years, called for a new system of complaint-driven rental inspections to be organized through two new staff positions -- one full-time, one part-time -- and funded with a $35 annual per-unit fee charged to landlords. The proposal went over -- as a Times-Standard reader put it on that paper's Web site -- like a turd in a punchbowl, at least among those who'd be affected by it directly. Outraged landlords and property managers began calling and e-mailing Glass, insisting that the inspections would violate privacy rights; claiming they shouldn't be held responsible for all Eureka's problems; questioning the broken windows theory; and arguing that the plan would invite tenant and staff abuse. Besides, they said, the City already has regulations to address these problems; just enforce the existing laws! The debate seemed headed toward a dramatic vote in council chambers. But last Tuesday, with only a few stalwart opponents in attendance, Glass abruptly and unexpectedly caved. There would be no new inspection ordinance, he announced, no additional staff positions -- just a business license requirement for all landlords and a slightly different fee structure. "I'm not embarrassed by the things we were proposing before," Glass said in his characteristically dry delivery. "But I've been persuaded that they're not gonna fly." He remains skeptical -- as is his professed nature -- that baby steps like the one's now being proposed will make much of a dent in Eureka's crime problems. "But who knows," he said flatly. "Maybe this will do it. It's worth a shot." Alyssa Docktor and her friends sometimes stare out her front window with binoculars, lights out, watching the horror show across the street. "It's really bad," she told the Journal last week. 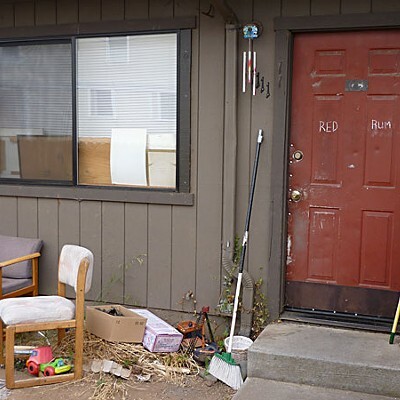 The apartment complex -- strewn with garbage and cat feces, broken windows kept in place with packing tape or boarded up with plywood -- is among Eureka's most notorious trouble spots. Recently, Docktor watched as a woman fled into an apartment, locking out five angry women behind her. They yelled. One approached the apartment and somehow broke a window. A man emerged with a handgun, threatening to shoot the women. Then another guy from another apartment came out with a gun tucked into his jeans. More screaming, posturing and, eventually, all-out fighting ensued. The police finally arrived, but not before one woman's face had been bloodied and swollen. "The cops are usually patrolling this area by around 7 or 8 every night," Docktor said. They end up at the complex across the street, by her estimate, "every other day, at least." Lisa Ollivier can relate. For years she and her neighbors were tormented by the goings-on at their own neighborhood hell-hole -- drug deals, prostitution, explosions, violence. She helped form a neighborhood watch group, which met with the property owner and contacted city officials, to little effect. Finally, after enduring six months of being too afraid to leave her own home except to run to her car, Ollivier's neighbor, Jerry Droz, successfully sued the property owner in small claims court ("Sometimes Jerry Wins," April 12, 2007), and the problems eventually dissipated. Ollivier, now a landlord herself, has been on Glass' housing task force since its inception. The group was designed, Glass says, to represent a broad spectrum of expertise and backgrounds: Lance Madsen is the community liaison for the Housing Authorities of Eureka and Humboldt County. Keith Taylor works with Native American communities. 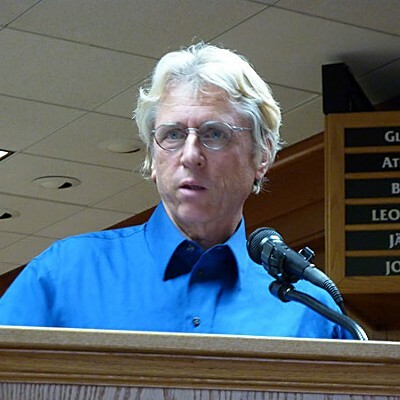 Mel McKinney is active in numerous environmental groups. Tim Flemming (who has been M.I.A. of late) works in substance abuse treatment. Barbara Hill is active in the Catholic church. Glass assembled the group shortly after his election, aiming to make good on his campaign promise to address Eureka's crime problem, and the task force's volunteer members came to believe the resolution lay in the broken windows theory. The concept first surfaced in a 1982 Atlantic article by Dr. George Kelling, a criminologist and former probations officer, and James Wilson, a political scientist then at Harvard. In recent years the theory has gained credence as clinical studies have produced evidence supporting the hypothesis. In places such as New York City, Lowell, Mass. and Groningen, Netherlands, researchers observed how neighborhood cleanup efforts produced a significant reduction in crime rates. "Our original aim, once we decided to [address the issue] based on rental housing, was to raise the quality of life for folks," Ollivier told the Journal last week. She has personally observed the broken windows effect in the demeanor of those who reside in substandard conditions. "After so long of living in yuck, you start to wonder if that's where you belong," she said. During their two years of research and preparations, the task force met with landlords, property managers, realtors and other concerned citizens, as well as the ACLU. 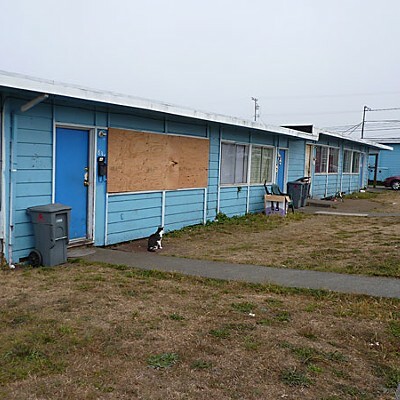 They came to the conclusion that, while there are regulations to address substandard living conditions in Eureka, they're scattered throughout the municipal code, making enforcement difficult -- a problem exacerbated by a shortage of staff. The document they presented as a remedy -- the one that sparked so much outrage -- would have added 11 pages of regulations to the municipal code while also amending five related provisions to raise the qualifying bar for conditional use permits. "This [ordinance] created a nexus in the law -- sort of one-stop shopping to make things easier on landlords and tenants," Ollivier said. Many California cities have instituted some variety of rental inspection ordinance, including Los Angeles, San Jose and Richmond. Sacramento is currently engaged in a rental housing inspection pilot program, with Sacramento County preparing to do the same. 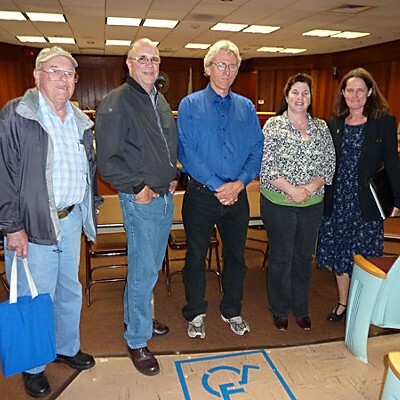 Carrie Simpson, neighborhood services manager for Rancho Cordova, saw how the program functioned when she worked in San Jose, where a rental inspection ordinance has been in place for more than 20 years. Asked if the broken window theory held true in the 10th largest city in the United States, Simpson replied, "In my opinion, there's definitely a correlation." Upon moving to Rancho Cordova, she decided to institute a similar ordinance in the Sacramento suburb. The program, launched early last year, has been a success, she said. Simpson said property owners have actually embraced Rancho's rental inspection program. "They start out fixing holes, then decide to redo the landscaping or paint the house, and they feel really good about it afterwards" -- a sensation no doubt partially inspired by the corresponding effects on their investment. "It will keep their property value up in this economic climate," Simpson said. A crucial element to the program in Rancho Cordova, population 61,000, has been education and outreach -- something that may have been fatally lacking in the approach taken by Glass' task force. In Simpson's program, landlords sit down with city staff, law enforcement and sometimes even bank representatives to discuss the regulations. "We only penalize people who refuse or drag out doing the necessary repairs," Simpson said. She suggested that the Eureka landlords who opposed the local ordinance are simply scared, and that the city should work on education. Landlords and property managers reached by the Journal insist that, if they were scared of Glass' proposal, they had good reason to be. "I feel it was a waste of money," said Joe Mori, who owns numerous rental properties in Eureka. "What made me mad about it was that all these ordinances were already in place. ... And they've got people down there [at City Hall] who don't do a goddamn thing. They're a bunch of deadbeats." (He made a point to say there are good people there, too.) Jim Paye, another Eureka landlord, agreed that the ordinance was redundant. "I think it's another joke," he said. "They're just building government." A fundamental objection to the ordinance was the idea of forced or coerced inspections. As many property owners pointed out, it's illegal to enter someone's home without permission or a warrant -- except in an emergency. On July 30, an Alameda County Superior Court judge found in favor of that county's Rental Housing Owners Association in their lawsuit against the City of Hayward. The RHOA objected to provisions in Hayward's rental housing ordinance, which they said allowed mandatory inspections without first obtaining tenant consent -- a clear violation of the Fourth Amendment. In his ruling, Judge Frank Roesch agreed, commanding the city "to repeal or cure the Constitutional and statutory defects" in its municipal code. Glass said his proposed ordinance would have been "administrative and polite" and that the city would never have demanded entry without consent. But Carla Baku, who rents out a mother-in-law unit on her property, said that's not good enough. "Let's say an inspector comes up to my tenant's door and demands entry," Baku said. "A lot of people are cowed by authority. If they don't know what their rights are, they're going to [allow entry]." She was relieved when Glass dropped his proposal, saying with a chuckle that she might now be able to vote for him. While Baku sympathizes with the task force's intent, she said the ordinance was flawed. "When things like this slide into the bureaucracy it becomes a matter of complying to the letter of the law in minutiae without really looking at what's going on with human beings," she said. Ted Loring, a property manager with Eureka's Rental Property Management, agrees. "The ordinance they put forward was baroque but well-intended," he said. "It was confusing and, frankly, for a lot of people, a little frightening." Specifically, Loring objected to what he saw as punitive late fees and the assumption that crime and blight emanate primarily from rentals, not owner-occupied homes. He believes the task force was driven by "possibly inaccurate perceptions" rather than facts. "You have to look at the costs and benefits," Loring said. "The objective seems to be to clean up properties. Anything that achieves that objective in a reasonable way deserves support." Glass' ordinance was not reasonable, he said, as the sheer number of people who opposed it demonstrated. "I have attended a great number of discussions in and around City Hall, and this was probably one of the best attended I've ever seen -- and not just the bodies, but the people that were there. These people are really strong contributors in our community," he said. "They're good people." Loring thinks Glass simply misplaced his focus. 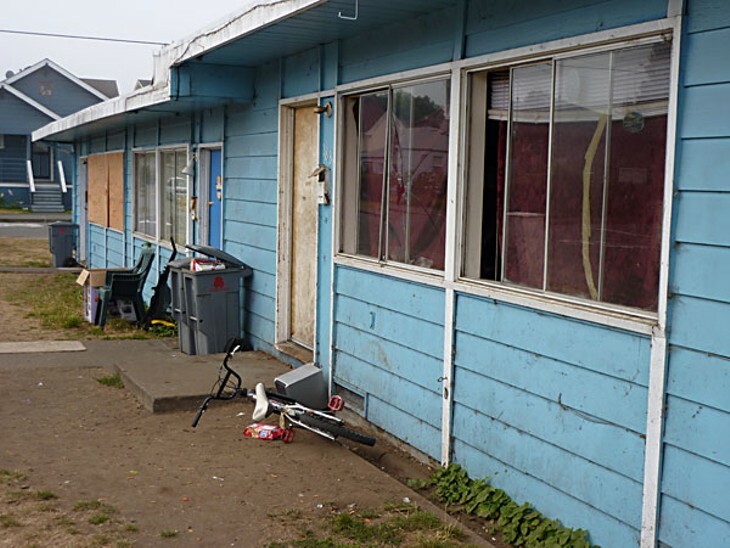 "The objective is to have more effective code enforcement in Eureka," he said. "Rentals are a piece of that, but not the whole picture. I think you have to look a bit more broadly." So what's in the new, scaled-down proposal? Glass wants to institute a business license requirement, allowing the city to build a database of contact information for all Eureka landlords and property managers, even those renting out a single unit. The license would cost $15 annually for the first unit, plus five dollars for each additional unit. Many landlords aren't aware that a similar policy already exists. The current business license costs owners of four or more units $55 per year, plus $11.50 for each non-owner employee. Or it's supposed to, anyway. Compliance, by all accounts, is exceedingly poor. Until recently, city staff estimated that Eureka has somewhere around 2,500 rental units. More recent estimates put the number closer to 6,000, with relatively few landlords holding the appropriate license. Glass is also hoping the city will establish a coordinator position, with the salary coming through a shifting of existing resources. This coordinator would essentially monitor code violations and delegate enforcement to the appropriate agency -- "kind of a triage person," said Eureka Police Chief Garr Nielsen. Nielsen's department will be taking on some of the enforcement burden as well, specifically through the EPD's new Problem-Oriented Policing unit. If, for example, a complaint comes in about people selling drugs out of an apartment complex, clearly that's a police issue. "In those kinds of cases the POP would begin an investigation," Nielsen said. "If the complaint is more related to the conditions of a building...that will be handled by the building department." And so on. Eureka Assistant City Manager-Operations Mike Knight, who oversees enforcement of municipal code violations, said they might find someone for the coordinator job in the building department, where things have slowed down in the sluggish economy. Knight believes such a move would be beneficial. The persistent problems at certain properties, he said, mostly stem from a small group of landlords who operate on the fringe of compliance. "I can think of several properties where we become aware of a problem, we get a complaint, send out two notices or issue a citation, and [the owner] will finally come into compliance. Then a few months later it returns to our department," Knight said. "It's cyclic." Knight suspects Glass' initial ordinance could have solved many problems. "Having more staff and resources would certainly help," he said. Nevertheless, he's hopeful that things will improve under the latest proposal. City staff has been working hard on code compliance, he said. "But we will do better. We'll make that effort." Such attitudes suggest to the members of the housing task force that there has been a sea change at City Hall and beyond, one that may prove more effective than any ordinance they could have drafted. "I think you have seen an evolution in public perception," Ollivier said following last week's forum. "In the beginning you had a lot of people saying this isn't a big problem. But at the Wharfinger it was almost every speaker saying, 'We agree there's a problem.' That's a big change." "Yeah," Glass agreed. "We've gotten out of the denial stage." He expects to put his new proposal before the City Council sometime later this month. Even if it passes, the task force plans to continue meeting, and not just with each other. They have an agreement with City Manager David Tyson to convene monthly meetings with the new coordinator, department heads, City Attorney Sheryl Schaffner and Chief Nielsen. "I am gonna monitor this thing, as the rest of the task force will do with me," Glass vowed. "If a year from now I'm not satisfied, then we'll be right back here again, proposing some sort of change." In other words, he'll be keeping his eyes peeled for broken windows.